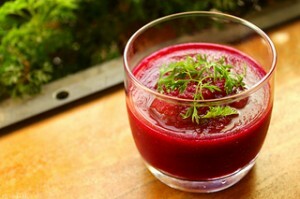 This bright red color of beetroot juice appeals to both the eyes and tongue. Don’t control the urge. This super food has a lot to add to the health factor as well. Let’s see the amazing health benefits of beetroot juice. Beetroots contain betalains – this amazing phytonutrient provides antioxidative and anti-inflammatory action. It helps in detoxification too. Beetroot juice provides an array of health benefits. It has protective as well as curative function on our health. #Lowers Blood pressure – Queen Mary University of London had published a study in the American Heart Association journal. The findings said that beetroot juice (250 ml) and nitrate tablets instantly lowered blood pressure in a person within 24 hours of consumption. Beetroots contain nitrates which are converted into nitrites by the salivary action, and these nitrites exert a blood pressure lowering effect. # Reduces the blood cholesterol levels – Beetroot fibre along with its folate helps in reducing the blood triglyceride and blood cholesterol levels. To avail these benefits of beetroot juice, you must avoid straining the juice. Eating whole beetroot is more beneficial to make the most of cholesterol lowering abilities. #Helps in treating jaundice – Consumption of beetroot juice is beneficial during an episode of jaundice. It provides the needed fluids and carbs in this condition. # Protection against liver diseases – Beetroot juice helps in providing protection against diseases of the liver that occur due to fatty deposits in the liver. These deposits can be caused due to alcohol abuse, diabetes, conditions like protein deficiency and obesity. Beetroot juice helps in proper digestion by increasing the secretion of digestive acids and also helps in treating conditions like hypo – chlorhydria. Beetroot is a natural laxative and helps in treating constipation and haemorrhoids. The antioxidants in beetroot juice promote the growth of CD8 cells. These cells have an ability of detecting and removing abnormal cells. Researchers have found that the antioxidant betanin found in beet can lower the rate of growth of tumor cells in the colon, breast nerves, testicles and stomach and lungs. Betanin exerts this action through multiple mechanisms. Further researches are being conducted in this regard. Beet might just turn out to be the next anti-cancer food! Beetroot contains magnesium which is essential for absorption and utilization of calcium. Hence it is beneficial in conditions like osteoporosis. Better utilization also assures that the inorganic calcium will not get deposited in the blood vessels and it hence it can prevent problems like kidney stones, gout, arthritis and atherosclerosis. Beetroot provides 37 % of the daily requirement of folate and thus helps in conditions like anaemia. It also is rich in iron – 6% of daily requirement) thus helpful in conditions like iron deficiency anaemia. It also helps in the haemoglobin build up. Beetroot juice is especially beneficial for expectant mothers. Folate content is high in beetroot which helps in preventing birth defects. Beetroots are rich in iron too – this helps in increasing haemoglobin with the increasing blood volume and hence avoiding anaemia during pregnancy. The amazing detoxifying abilities in beetroot help in curing skin problems like acne and inflammations. Its overall nutritional value helps in refreshing and nourishing the skin and keeping it hydrated all day long. You can also make a nourishing face pack using beetroot. In rare cases some people observe red urine after consumption of beetroot in any form. While beeturia is not harmful, it is an indicator of problem in the iron metabolism in body. A health check up in relation to iron metabolism is recommended. I was just going through your blog. I am 9 weeks pregnant and after medical examination just came to know that blood sugar level are very high after fasting…. I will like to tell u a brief background about my medical history, neither my parents are diabetic, but I am even suffering from gallstones. Payal it will be a great help if u can guide me…..
Hi payal I’m 8 month pregant pls suggest the proper diet plan at that time. I am 6 weeks pregnant and i usually drink apple, carrot and beetroot juice twice a week. before pregnancy i used to drink it daily. would you please let me know if its ok to drink apple carrot and beetroot juice daily in pregnancy? One of my friend has also mentions that if i will drink beet juice in pregnancy, then it will give pinkish skin tone for my baby? is that true? I am 43 yrs old.how can I use beetroot without making its juice.can i keep it dipped in water for 8 hrs and use it as detoxing agent.will this increase my haemoglobin?.As my hb is 9.5 only. the best combination is chop beetroot in small cubes , mix it with pomogrante and apple , which is similarly chopped in same size , remember to dress it with very little lemon and eat it on a regular basis , i have seen HB increasing withon 1 week if this is had religiously everyday . I am 15 week pregnant and having high sugar level and low heamoglobin 9.1. Is Beetroot/Juice good to take? And what foods should be taken to maintain both. Fruits contain natural sugars. which fruits should be avoided?Please let me know..
https://www.dietburrp.com/indian-diet-plan-for-gestational-diabetes/ check this. you will get the answer to all your questions here. My in is only 9,tell me how I consume beetroot juice.